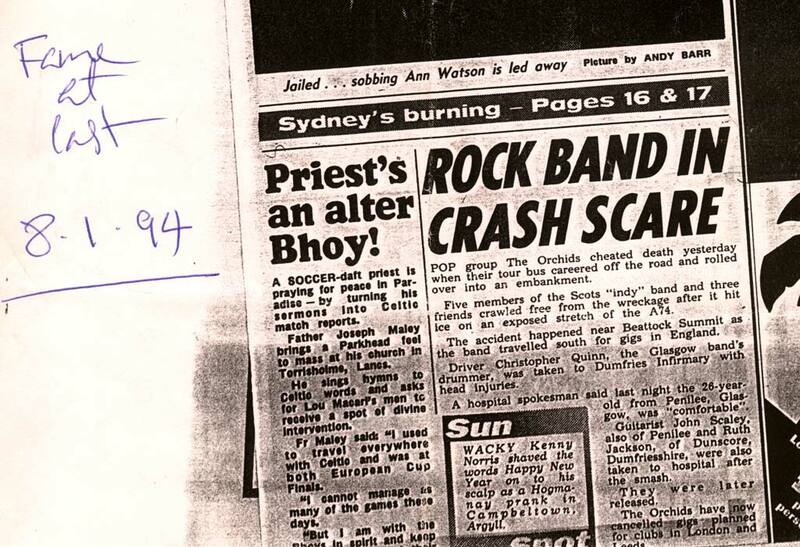 But, on a more positive note, here’s the (Glasgow) Evening Times bringing news of what happened two weeks later, and also explaining why Striving For The Lazing Perfection is called what it is. Though I’m not entirely sure they’re right. 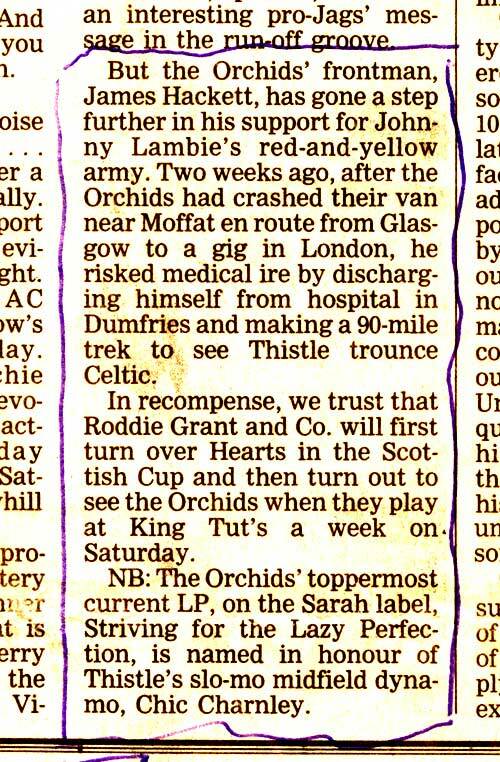 Footnote: we obviously didn’t find out about the Orchids’ crash till just before soundcheck, which didn’t give a lot of time to sort out adding anyone else to the bill. 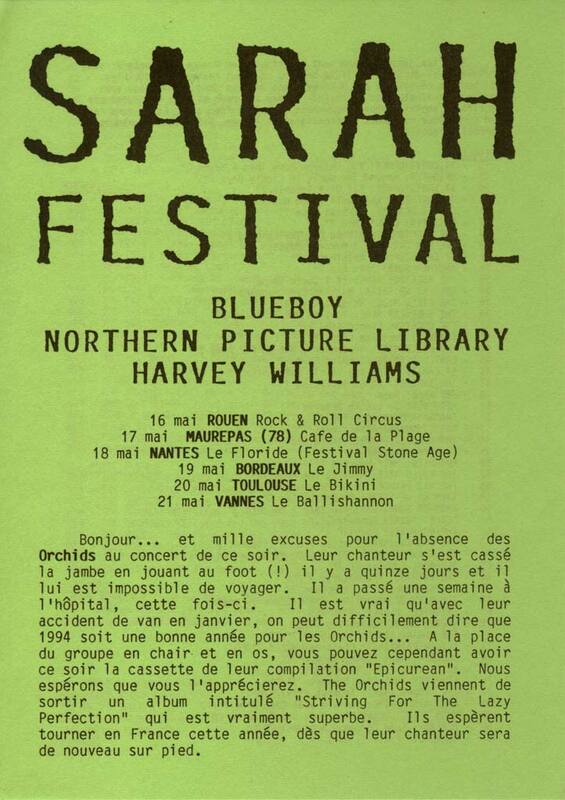 But then Harvey suggested he and Bobby did some Field Mice songs, given they were there anyway (Blueboy and Northern Picture Library had been due to support). So they did, including, as Clare says in the There And Back Again Lane booklet, three songs they never played live when the Field Mice were still going: Willow, An Earlier Autumn and A Wrong Turn and Raindrops, the last of those with Harvey on harmonica, which he never played on the record. For If Wishes Were Horses, we had the bright idea of taking our own publicity photos in order to save some money. After all, how difficult can it be? Hmmm. 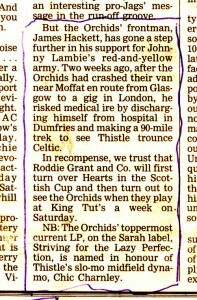 Let’s put it this way: we never tried again. 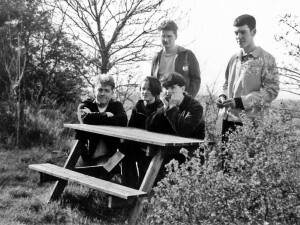 This one was taken in the garden behind the studio (White House Studio, Weston-super-Mare) during a break in recording. 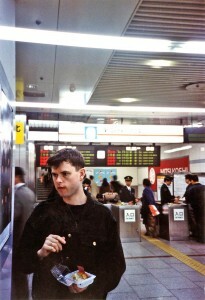 Backstage somewhere, possibly in Japan judging by Gemma’s lanyard. The walls were completely blank half an hour earlier, you know. 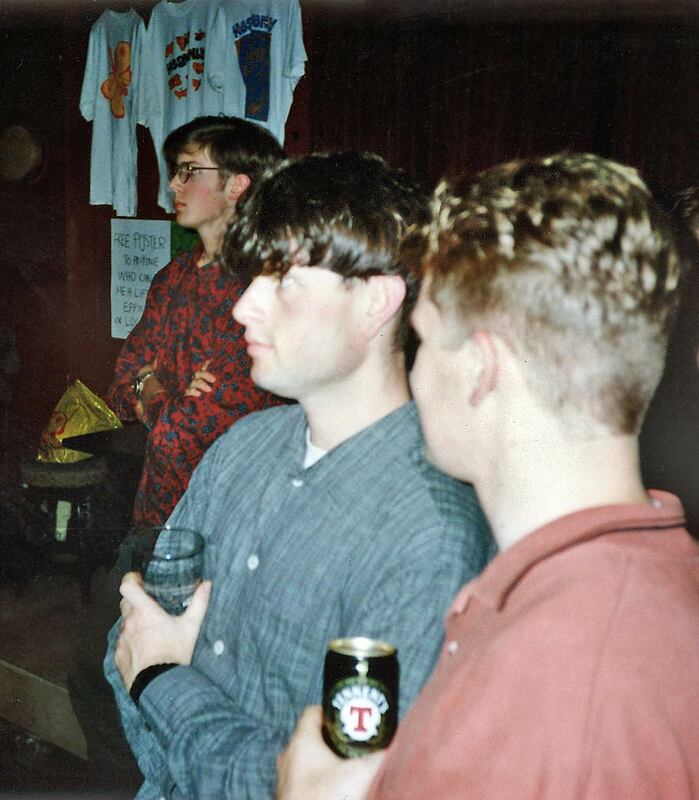 A photo of Keith and Paul watching Heavenly at the Harlow Square in July 1992 – I know it was at the Harlow Square because, if you look closely, you can see the T-shirt stall, on which I’ve stuck a rather forlorn note offering a free poster to anyone who can give me a lift back to either Epping or Loughton station afterwards. 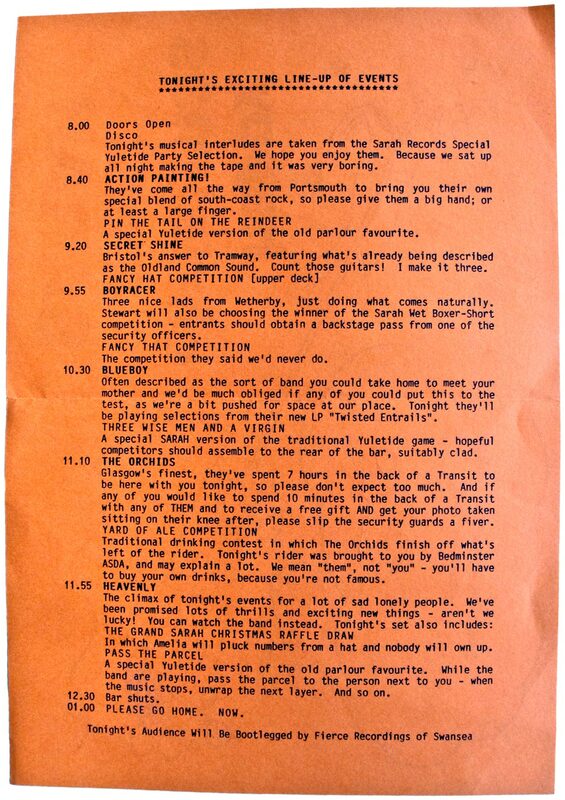 I presume somebody must have obliged, otherwise I’d have had to spend the night in Harlow, and if I’d done that I’d now be twice divorced with three kids and living in… Harlow. 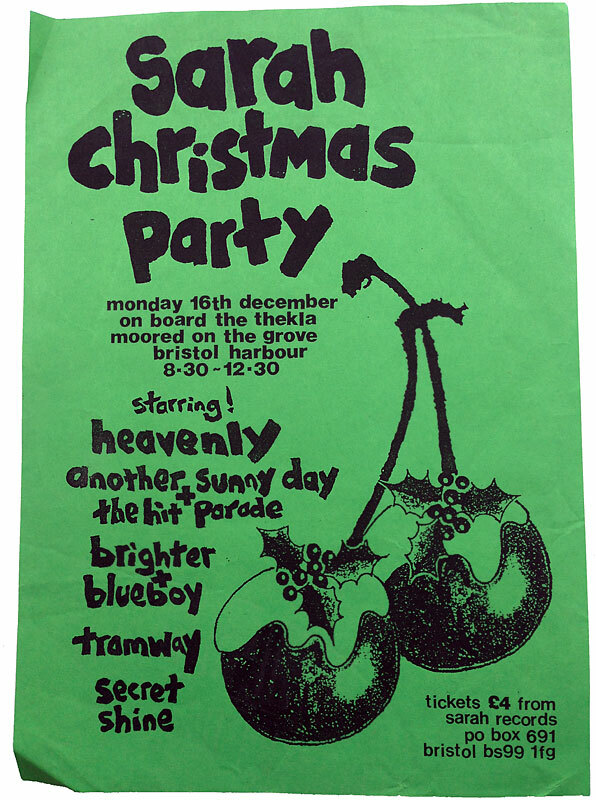 The poster would have been the one we did for Heavenly’s Le Jardin… tour. 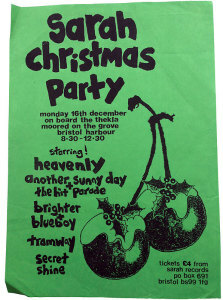 Though this one here advertises the gig itself. A typically whimsical French tour; we’d been assured that the gig at the Cafe de le Plage was a Paris showcase, despite no one in Paris having heard of the venue… not surprising, in retrospect, as it was in Maurepas, a small town 20 miles west with no station (it’s twinned with Waterlooville; say no more). The Orchids were supposed to headline, but singer James had broken his foot playing football – this only months after the London launch of Striving For The Lazy Perfection had had to be cancelled after their van fell off the M6 near Carlisle. But Harvey stepped in, and we seem to have given away free cassette copies of Epicurean, which sounds ridiculously generous. 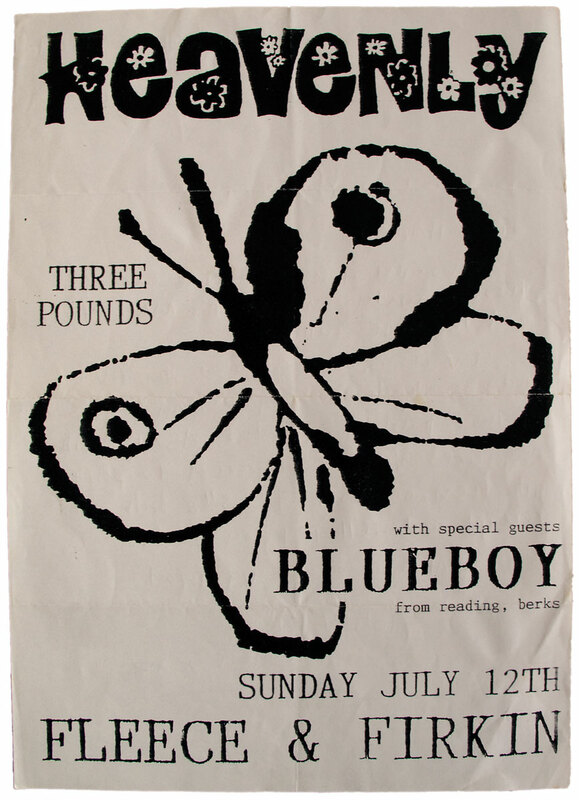 If you’ve always wondered why Blueboy’s Toulouse was called “Toulouse”, by the way, it’s because it was written outside Le Bikini in Toulouse. A poster from what people later referred to as our alliterative period, which lasted for much of October 1992. 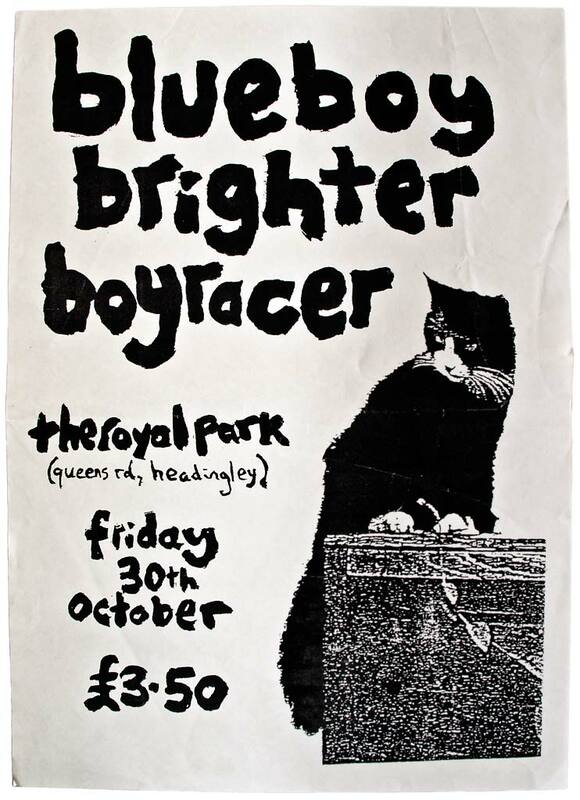 The Royal Park was in Headingley rather than central Leeds, and my main memory is of someone trying to sell me drugs within five minutes of arriving for soundcheck that afternoon. That’s actually my only memory, to be honest, but that has nothing to do with the drugs. The cat is Jessica, and that’s our fence (again: garden, not drugs). 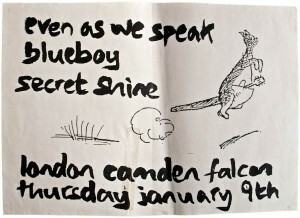 A poster from January 1992 for a gig at the Falcon in Camden Town. Design by Sarah Records based on an original by E.H. Shepard. 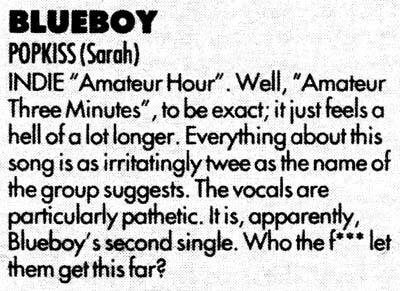 Although both Blueboy’s Sarah albums were put online some time ago, and tracks from their singles were included on our label compilations, that still left quite a few holes. 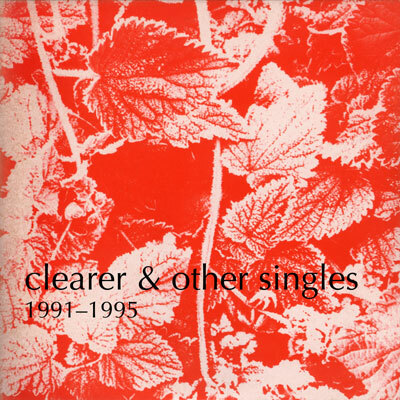 Alison, for instance, the dreamy, shimmering, rainwashed B-side of their debut 7″ (“… there’s rain on the window, rain from the black sky, and England looks pretty to me…”). 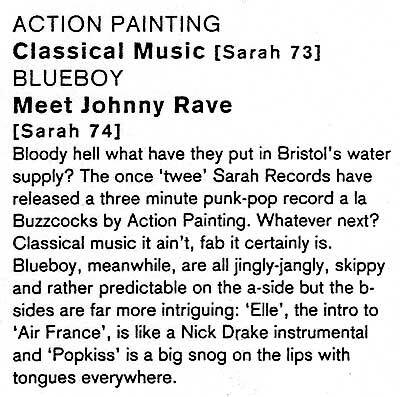 Or twisting, tumbling, cello-driven, two-and-a-half-minute guitar-pop classic Meet Johnny Rave (“… there must be more to life than just getting by… so much more…”) – technically the A-side of SARAH 74 but, when we came to compile Gaol Ferry Bridge, we chose instead to include the haunting, hushed melancholy of Air France (“… smile me into bed and take my innocence… smash my little head and drag me far away, away, away…”). 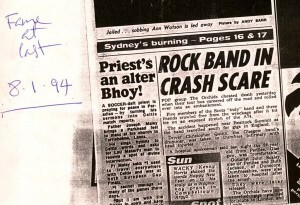 Or Hit, B-side to River, with its electronic rhythms and echoing piano (“… fame startled you… hit the booze, hit your dad…”). 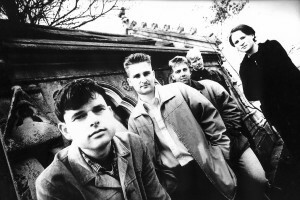 And, of course, the majestic River itself was never included on one of the band’s own albums – Sarah singles never were – so it was easy to miss this “swooning near-epic made infinitely more tearful by oceans of creamy orchestra” (NME) with its “gloriously overblown orchestral synths that echo the Pet Shop Boys at their most grandiose” (Melody Maker). 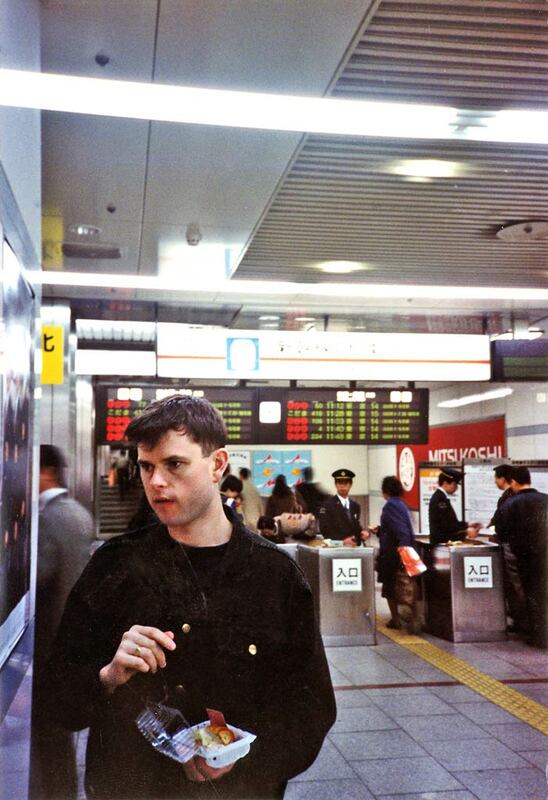 And the same goes for the “delicately fluttering acoustic confection made from rice paper and sheer fresh air” (NME) that is Try Happiness (“… holy summertime, sleepless nights spent hugging desperation, lead-lined windows like my heart wide open…”). 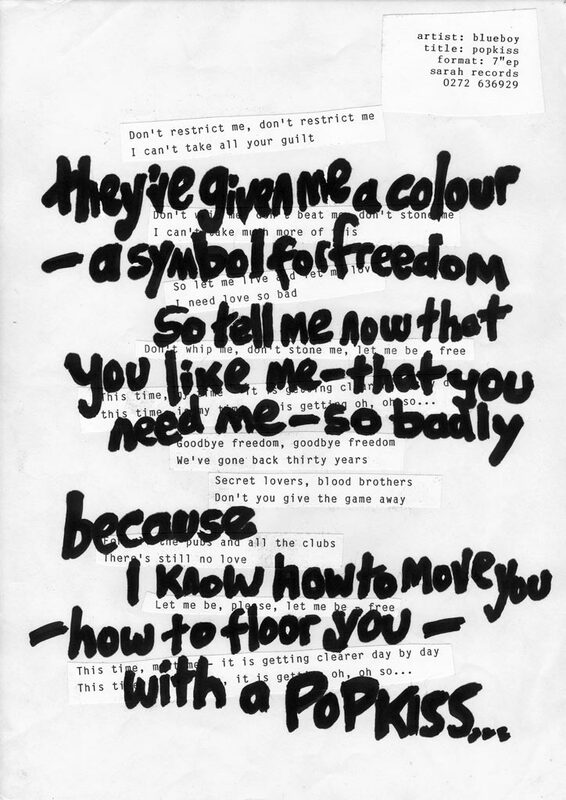 Or the taut, confrontational, electric anger of Popkiss (“… they’ve given me a colour, a symbol for freedom – so tell me now that you like me…”). 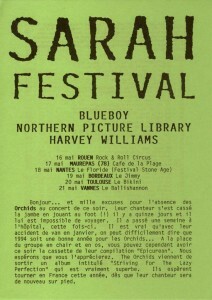 Or, of course, Toulouse, the last song ever released on Sarah, with that simply stated final line: “I don’t want to change the world any more…” So, we’ve collected them all together under the title Blueboy: Clearer & other singles, 1991-1995, and they’re now available for streaming and download via the usual suspects. 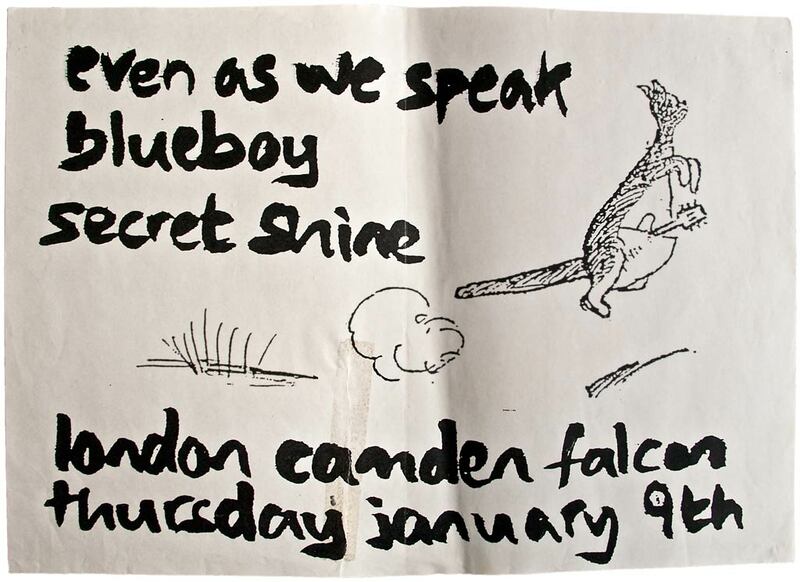 A poster designed by the band to advertise a short tour in July ’92 promoting the release of If Wishes Were Horses. 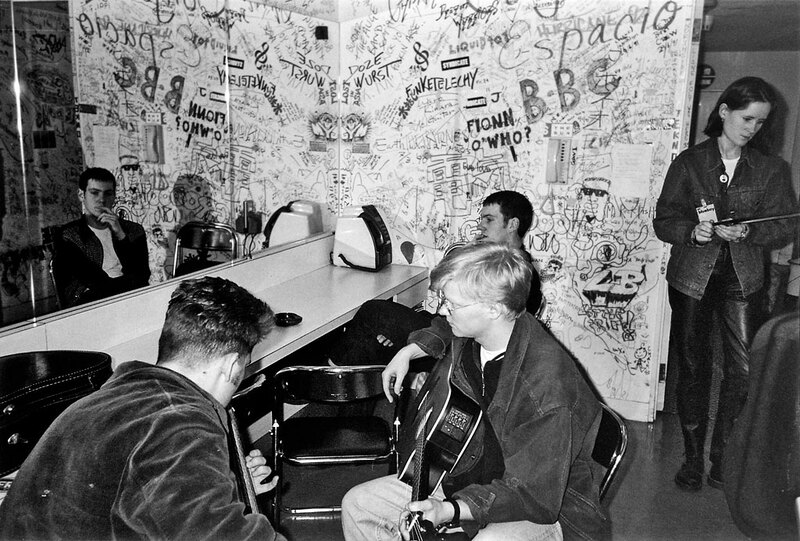 In those days, it was generally thought that if you didn’t have time to do a full-length tour, you should at least try to play (a) London, (b) your home town and (c) Harlow. 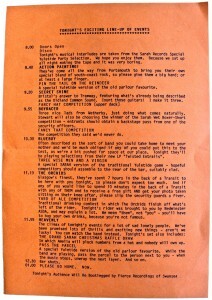 Original paste-up artwork for the press release for Blueboy’s second single, Popkiss. 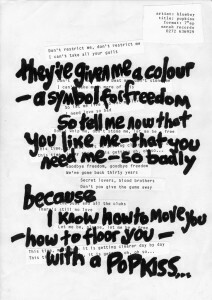 Underlying typewritten text is from their first single, Clearer. 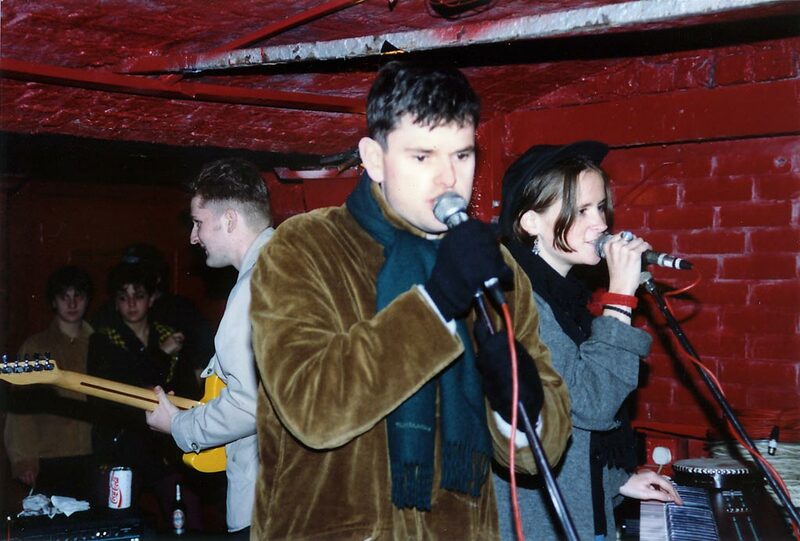 Paul, Keith and Gemma onstage at Planet X, Liverpool, 1993; it was cold, the ceiling was leaking, there was rainwater on the floor. 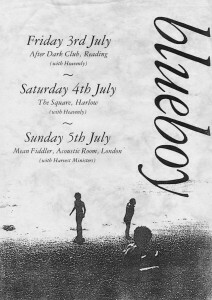 Poster for a gig in July 1992 at Bristol’s Fleece & Firkin to promote Le Jardin de Heavenly. 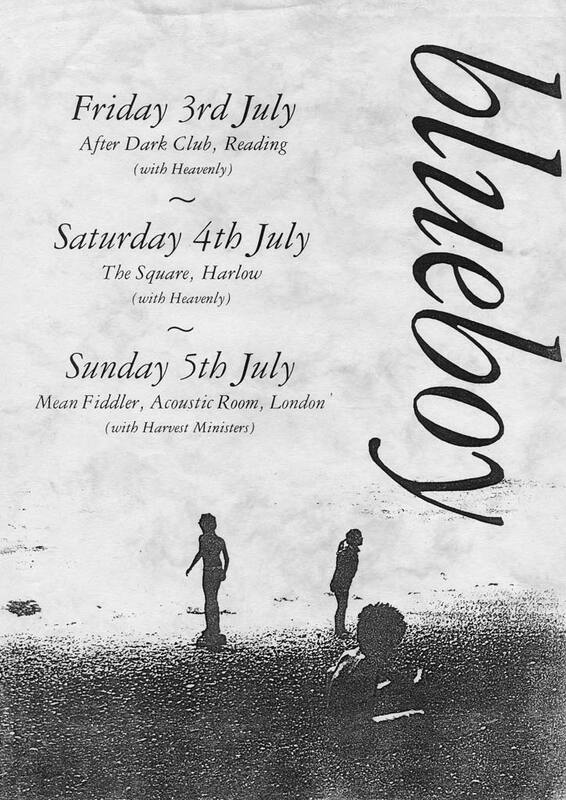 Blueboy at this point had only released one single for us.